In our opinion, Stryker Corporation and subsidiaries maintained, in all material respects, effective internal control over financial reporting as of December 31, 2014, based on the COSO criteria. We also have audited, in accordance with the standards of the Public Company Accounting Oversight Board (United States), the consolidated balance sheets of Stryker Corporation and subsidiaries as of December 31, 2014 and 2013 and the related consolidated statements of earnings and comprehensive income, shareholders' equity and cash flows for each of the three years in the period ended December 31, 2014 of Stryker Corporation and subsidiaries, and our report dated February 12, 2015 expressed an unqualified opinion thereon. /s/ ERNST & YOUNG LLP Grand Rapids, Michigan February 12, 2015 STRYKER CORPORATION 2014 Form 10-K 36 ITEM 9B. OTHER INFORMATION. Not applicable. PART III ITEM 10. DIRECTORS, EXECUTIVE OFFICERS AND CORPORATE GOVERNANCE. Information regarding regarding our executive officers appears under the caption "Executive Officers of the Registrant" in Part I, Item 1 of this report. 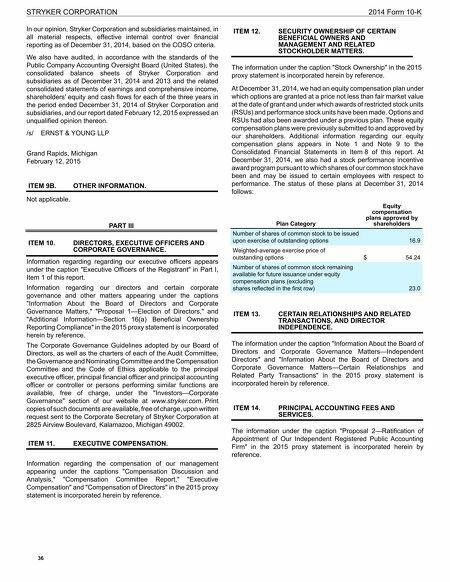 Information regarding our directors and certain corporate governance and other matters appearing under the captions "Information About the Board of Directors and Corporate Governance Matters," "Proposal 1—Election of Directors," and "Additional Information—Section 16(a) Beneficial Ownership Reporting Compliance" in the 2015 proxy statement is incorporated herein by reference. 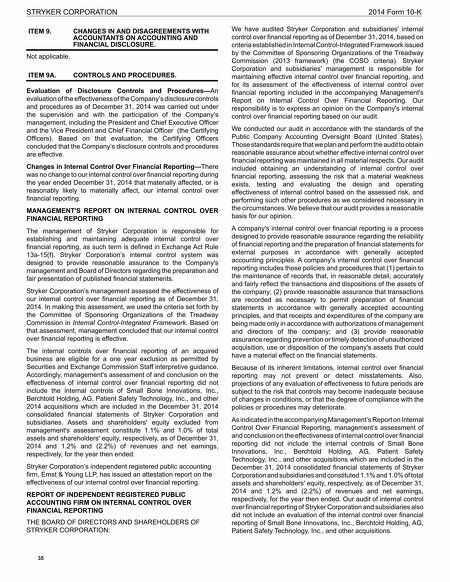 The Corporate Governance Guidelines adopted by our Board of Directors, as well as the charters of each of the Audit Committee, the Governance and Nominating Committee and the Compensation Committee and the Code of Ethics applicable to the principal executive officer, principal financial officer and principal accounting officer or controller or persons performing similar functions are available, free of charge, under the "Investors—Corporate Governance" section of our website at www.stryker.com. Print copies of such documents are available, free of charge, upon written request sent to the Corporate Secretary of Stryker Corporation at 2825 Airview Boulevard, Kalamazoo, Michigan 49002. ITEM 11. EXECUTIVE COMPENSATION. Information regarding the compensation of our management appearing under the captions "Compensation Discussion and Analysis," "Compensation Committee Report," "Executive Compensation" and "Compensation of Directors" in the 2015 proxy statement is incorporated herein by reference. ITEM 12. SECURITY OWNERSHIP OF CERTAIN BENEFICIAL OWNERS AND MANAGEMENT AND RELATED STOCKHOLDER MATTERS. The information under the caption "Stock Ownership" in the 2015 proxy statement is incorporated herein by reference. At December 31, 2014, we had an equity compensation plan under which options are granted at a price not less than fair market value at the date of grant and under which awards of restricted stock units (RSUs) and performance stock units have been made. Options and RSUs had also been awarded under a previous plan. These equity compensation plans were previously submitted to and approved by our shareholders. Additional information regarding our equity compensation plans appears in Note 1 and Note 9 to the Consolidated Financial Statements in Item 8 of this report. At December 31, 2014, we also had a stock performance incentive award program pursuant to which shares of our common stock have been and may be issued to certain employees with respect to performance. The status of these plans at December 31, 2014 follows: Plan Category Equity compensation plans approved by shareholders Number of shares of common stock to be issued upon exercise of outstanding options 16.9 Weighted-average exercise price of outstanding options $ 54.24 Number of shares of common stock remaining available for future issuance under equity compensation plans (excluding shares reflected in the first row) 23.0 ITEM 13. CERTAIN RELATIONSHIPS AND RELATED TRANSACTIONS, AND DIRECTOR INDEPENDENCE. The information under the caption "Information About the Board of Directors and Corporate Governance Matters—Independent Directors" and "Information About the Board of Directors and Corporate Governance Matters—Certain Relationships and Related Party Transactions" in the 2015 proxy statement is incorporated herein by reference. ITEM 14. PRINCIPAL ACCOUNTING FEES AND SERVICES. The information under the caption "Proposal 2—Ratification of Appointment of Our Independent Registered Public Accounting Firm" in the 2015 proxy statement is incorporated herein by reference.